With a stay at Maxim Hotel Tel Aviv in Tel Aviv (Tel Aviv Promenade), you'll be steps from Frishman Beach and 6 minutes by foot from Gordon Beach. Featured amenities include dry cleaning/laundry services, a 24-hour front desk, and multilingual staff. Free self parking is available onsite. With a stay at Herods Boutique Hotel Eilat in Eilat, you'll be near the beach, just a 2-minute walk from Kings City and 6 minutes by foot from Mifrats Beach. Free self parking is available onsite. 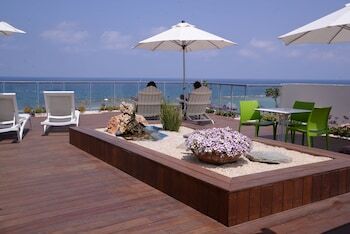 When you stay at El Yam Luxury Resort in Netanya, you'll be near the beach and 8 minutes by foot from Poleg Beach. Free self parking is available onsite. Vilmar Lighthouse offers accommodations throughout the area in Tel Aviv. A roundtrip airport shuttle is provided for a surcharge (available 24 hours). With a stay at Villa Topaz in Eilat, you'll be within a 5-minute drive of Dekel Beach and Papaya Beach. Free self parking is available onsite.